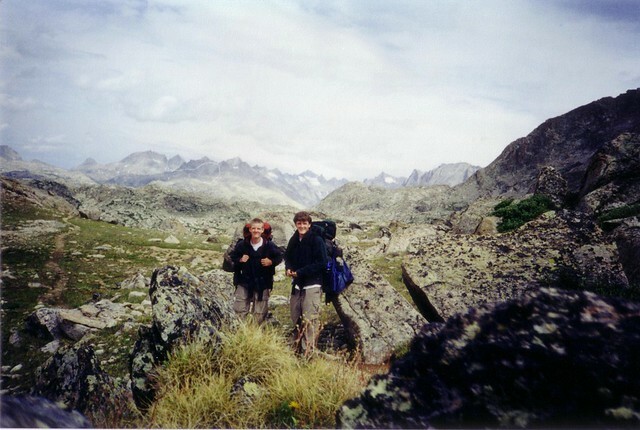 My first attempt to get away and do some backpacking after getting back from Nepal was in August of 2001. I waited around in Minnesota for a guidebook to show up: Climbing and Hiking in the Wind River Mountains, by Joe Kelsey. I waited til I got out there to get the maps that I had read about; I bought them from the ranger’s office right in Pinedale, Wyoming, but now they are available through Amazon (of course). You want the Earthwalk maps of the Wind Rivers, North and South. Anyway, armed with my guidebook, some of which I had skimmed overnight, I drove my old 1989 Mustang LX out to Pinedale taking I-90 from Minnesota to Rapid City, then cutting south around and through the Black Hills and taking two-lanes roads across Wyoming past Independence Rock (please tell me you know what it is — geez). Got pulled over once in southern Minnesota for having a radar detector in my windshield. I was driving 5 under at the time through a huge speed trap everyone on the CB radio had been talking about for 50 miles. The officer thought I was a druggie because I was going backpacking and had an incense holder on my dash and boxes of Zip Loc bags (for keeping things separate and dry in the backpack). Stood with my hands on the hood for a while, but no ticket. Independence Rock was fun. It’s a really fun scramble up, but I thought I was going to die on the way down. It seems way more steep when you have to either turn around and scramble backwards or walk forward down a steep-as- hell granite hill with all sorts of cracks and drop-offs. Tons of people do it, and it’s not horrible — it’s just that I was alone and didn’t really take a look at the damn thing for a route down before I started walking up. Eventually I found a way down and drove on. And compared to the elevation changes on the trail in Nepal, the Boulder Canyon Trail seemed like no big deal. But I underestimated the emptiness out there, and backpacking with a tent is a different world from trekking from lodge to lodge with hot meals and plenty of company. Somehow I glossed over “the arduous ascent of the canyon allows time to contemplate the trailhead’s low elevation” in Kesley. So I climbed to where I could see some disappointingly brown, non-alpine-looking peaks, which frankly was about as much walking as I could handle in one day (probably 12 miles to North Fork Lake by the time I found a campsite); then I made camp, hung out all afternoon bored to death but too tired to hike around, then slept as best I could. I had planned to shoot north on the Fremont Trail to Cook Lakes the next night, then Island Lake, the back south on the Highline to Chain Lakes for the fourth night, then to Lake George and out the morning of the sixth day. But I couldn’t stand it. The next morning I hiked straight back out, ate McDonald’s in Rock Springs as if I’d been starving in the wilderness for weeks, and high-tailed it across I-80 for Illinois (forget the back roads at that point). It was still a good experience, and the Winds are still the closest good option for a mountain trip with no backcountry permits (and the crowds that necessitate the permits in the first place) required. But you have to go further north than I did if you’re looking for stunning mountain views and higher trailheads. Scanned photos are in the Flickr album here. 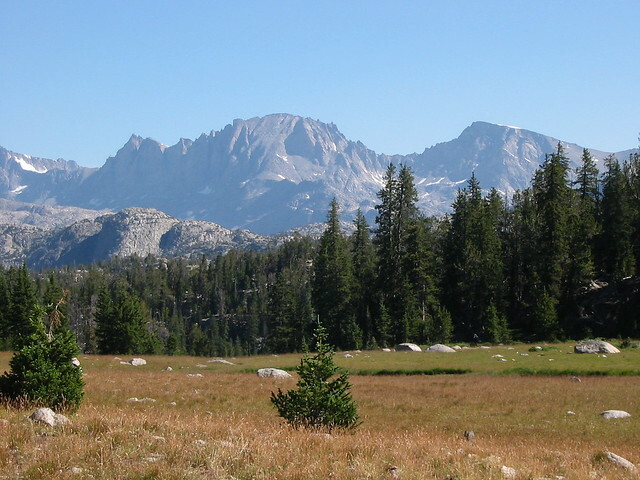 In August of 2002 my brother Jim and I went out to the Wind River Mountains for what was to be a weeklong trip from the Elkhart Park trailhead to Island Lake. We left from Minnesota and took the same back roads I had taken the year before (a route I shall credit to Uncle Mark, the well traveled truck driver), stopping at Independence Rock again. I had learned one lesson the year before, and that was to start at a higher elevation, so we were in beautiful country and in view of the highest mountains almost the entire time. We were going the long way around to get to Island Lake — Pole Creek Trail to Wall Lake, then cross country north to Island Lake where we would base ourselves for a couple days and try for a walk-up or two. Return was to be via Indian Pass Trail back to Pole Creek Trail. While we cut the trip down to a three-day loop (skipped the Wall Lake to Island Lake leg, still did the Pole Creek Trail and the Indian Pass Trail), we had a good time and mostly good weather. I think our trip over Lester Pass after we missed the turnoff for Wall Lake on the first afternoon was supposed to be a consolation for not getting to our intended destination. 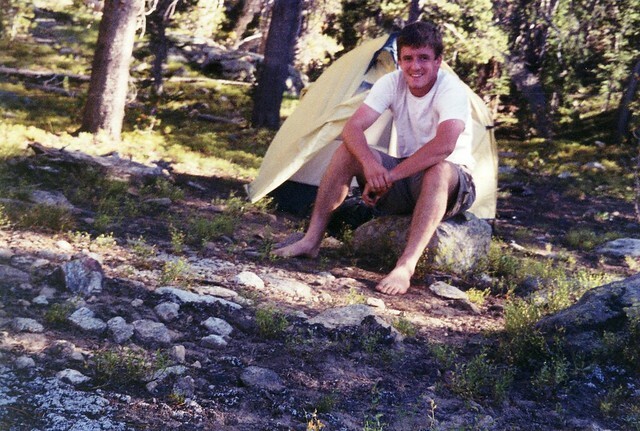 And it was Jim’s first wilderness trip of any sort, so he can’t complain too much about me cutting it to three days. I determined though that my biggest problem with staying out so long isn’t the walking or the distance — it’s largely the lack of a place to stay (one that I don’t locate and assemble) and good food (that I don’t prepare) at night, which is why Nepal was perfect. We didn’t have a digital camera at the time, so these are scans of our one roll of film. I’ve finally (in 2007) attempted to identify some of the places since I was much more aware of identifying peaks and lakes during our trip in 2005. You can see some of the results in this Flickr album. This was an early August 2005 trip to the Wind River Mountains in western Wyoming. It was my third trip to the range. We took two days to drive from Illinois, spent three days out there, and took two more to drive back. Again, we used the Climbing and Hiking guidebook and the two Earthwalk maps, North and South. Photos are in the Flickr album.